For my current Mimeo project I have been attempting to find vintage parts. Some are just un-obtainable. While I could spend a ton of time and money tracking down the LM323k with a Gold base, finding the correct date code and more importantly the early National Semiconductor logo would be nearly impossible. National Semiconductor has had a few logos since it's founding and the Apple-I regulator uses the earliest one dating back to the 60's. For the Apple-I/Mimeo what was required was a recreation of the National Semiconductor LM323k with 24k gold base. 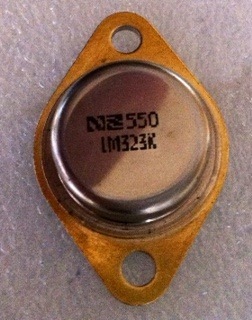 The core for this process is an actual NS LM323k, but of a more recent vintage in Steel. The base was cleaned using 000 steel wool. The original date and National logo were removed using 2000 grit wet sand paper. The final logo/labeling artwork was created by my 11 year old son and viewing a close up picture sent to me by an Apple I owner. The logo was transferred using "wax" hard surface laser paper and an iron. It took a few attempts to get a clean transfer. After each failed attempt I removed the logo with 2000 grit wet sand paper and let it cool before trying again. After each transfer, successful or not, I would test the LM323k using a breadboard, a 9v battery, a couple of capacitors and a volt meter. After you peel off the hard surface laser transfer paper and let it cool. Blast the print with a heat gun on high to "fix" the toner and make it permanent. I use a clothes iron for toner transfer, but I think in your case the heat gun was the better choice. I acutally do use a clothes iron, and then after it cools and I remove the "paper" I hit it with a heat gun to fix the toner. I had a "transfer-iron" which looks like a soldering iron but has a round flat surface for transfering toner, but I can't find it. I may have lent it out to someone who never returned it. Since I only have a few regulators right now to do I didn't bother buying a new one. If I decide I'm going to make a lot of these for other people I will have to get one as the clothes iron is only "Successful" to transfer properly about every 3rd time (I even just redid the sample from my image up here since it was missing a little part of a number). I don't think it really get's hot enough. I may also have to get a real "gold" plating system if I do that as well since the disposible plating pen's battery only lasts about an hour or so. I have to see about people's interest, my time and the cost to figure out if I will do that. Just a question: what is this "wax paper" you used for this? We're trying something similar but we can't understand what kind of paper is it. I had someone when I was looking for the yellow spectrol pot send me my own picture as a "photo" of the item when I asked for a picture to verify it is the correct one. This is why I tend to only trust certain suppliers. It took a long time for vendors to understand why I needed a specific part not one that just met the spec. By now I think my craziness has propagated though the usual suspect of vendors and it is a bit easier for the newer mimeo guys to track down as these vendors track demand and locate and hoard parts that get asked for a lot. Sometimes I have to coordinate with other vintage guys searching for parts for machines (not just apple-1 parts) to make sure that we don't overlap vendors. If they get two or three requests for a specific part in a time range, that part can double or tripple. For example I needed a tool to punch holes in a scelbi chassis. It was $30 or 40'bucks if I recall until there were a couple of inquiries and then it was $160 it something like that when I finally went to buy it. Obviously I found another source. I think this is the wax transfer paper Corey was referring to (or at least a similar item). Just run it though a color (or B&W) in this case copier and it will allow you to transfer the image (naturally reversed/negative image) to another hard surface.